Someone accidentally let some news slip a little early. 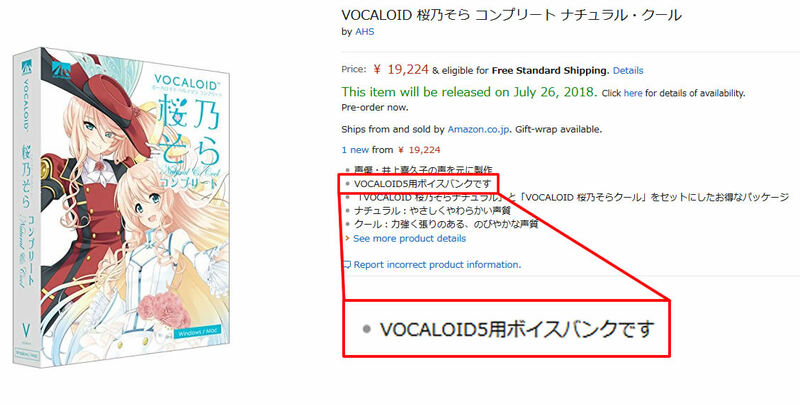 It looks like one of YAMAHA’s VOCALOID software partners, AH-Software, confirmed the upcoming announcement of the next generation VOCALOID5 synthesis engine with one of their products listed for preorder on Amazon Japan. YAMAHA themselves have not even announced such a product yet. The release is announced for July 26th, 2018, so we can likely expect YAMAHA to formally announce the VOCALOID5 engine soon. The software titled “VOCALOID SAKURANO SORA (COMPLETE) NATURAL & COOL” clearly mentions the inclusion of the VOCALOID5 editor. It even briefly mentions some of the VOCALOID5 editor’s parameters, called “VOICE COLOR, ATTACK & RELEASE”, the last two of which are all-new features we have not heard of before. What does this mean for Hatsune Miku fans, though? An update to her software can likely be expected sometime in the near future, of course!